Confession. I think I am a closet vegetarian. Not vegan, just vegetarian. I love cheese too much and I respect how beautiful cheese is made and cared for. But vegetarian, I could do. It’s rare, nearly every other month or so that I really crave…crave meat. I mean, I will break down doors to find myself a char-grilled, medium rare, salt and pepper crusted piece of flesh. But after that, I am pretty good with all aspects of meat for the next 59 days or so. But Joe on the other hand, will digress my lack of meat eating urges. 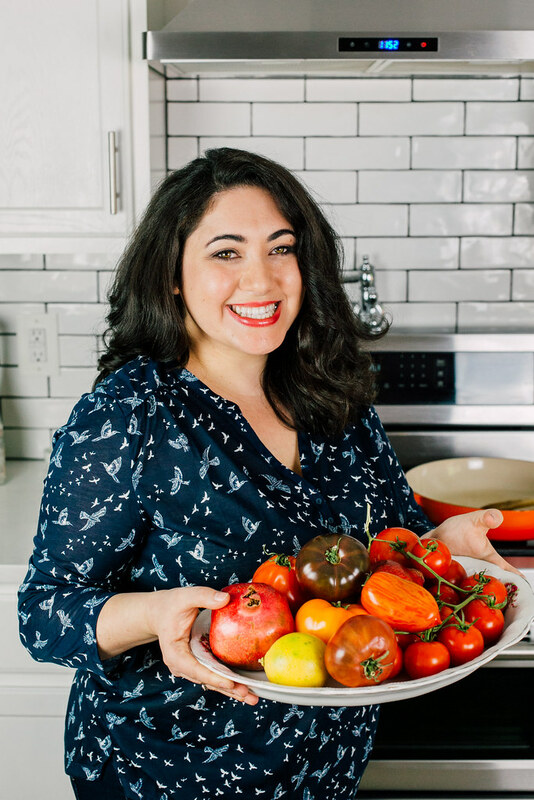 So because of that, I am beginning to pass on my wanna-be healthy habits on to my husband, and think of creative and delicious ways to create hearty vegetable dishes. Eggplant has always been on the back burner in our house and to be honest, the last time I cooked with it I made classic baba ghanoush. For years Joe would say that eggplant didn’t “react” with him well and because of that I have not bought the glossy vegetable in years. Until we were gifted with char-grilled eggplant on our kabob platter in Istanbul. It was along side the charred kabob, rice and pita and was able to soak up any additional flavor from the other ingredients. The eggplant was in its whole, but the skin was removed. It tasted smokey and charred and did not have a lot of seeds in it at all. Joe and I both loved the simple way this eggplant was prepared and promised each other we would give this gorgeous vegetable another shot. To be honest, I took the esthetics of this dish from my new obsession, the Jerusalem cook book. He has a recipe for stuffed eggplant where he lays the eggplant in half on his baking dish. I loved the simple and organic look of it bit didn’t want to use his recipe. So therefore, deconstructed baba ghanoush was thought of. I love all the flavors of baba ghanoush, the eggplant, the garlic and lemon, so instead I took all those flavors and just separated them. You would never find me doing this 6 months ago, mainly because I am hard to accept change and I like things traditional, but ever since I made my Mediterranean Nachos, well I dunno…I think I see a little bit of a creative streak poppin’ out. This is really a simple dish to make but does require a tad bit of prep work where most of the ingredients roast at the time. And it looks like a lot of spices in the recipe, but I promise it is not that many and most of the same spices are used all throughout the dish. Also, because my eggplant was so thick, I decided to cut it lengthwise into quarters, but if yours is thinner, please just cut it in half. Other toppings include roasted chickpeas, thinly sliced lemon, roasted garlic tahini sauce and for color and more flavor I added roasted beets (just because I had extra on hand) and an extra sprinkling of za’atar and sea salt. But honestly, I really believe this recipe is so versatile. I was also thinking of topping it with more citrus like orange peel or even roasted cherry tomatoes. I have to say, I really enjoyed making and writing about this recipe. And I hope you will let me know if you decide to make it too and what changes you made! Pre-heat oven to 400 degrees F. And begin to prep your ingredients. In a baking dish, place cut eggplant lengthwise. Use a knife and cut diagonal slits into the flesh but not through the skin. 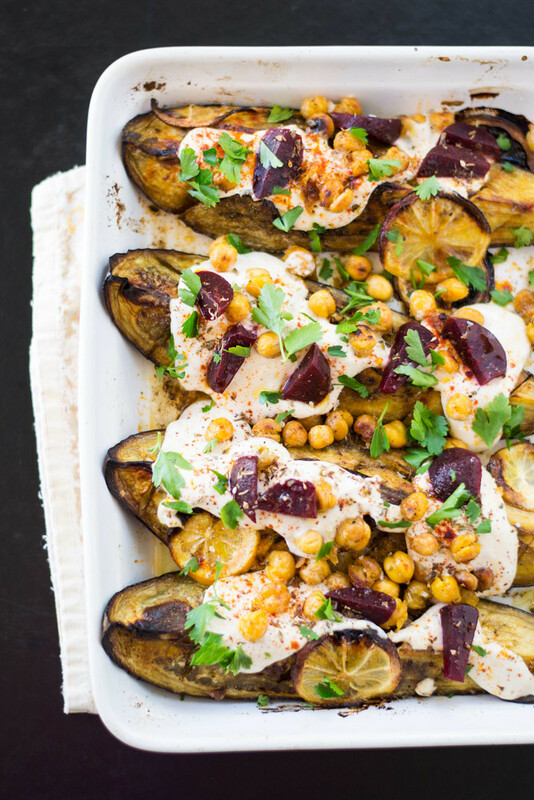 Use a pastry brush and brush on olive oil onto the eggplant then season eggplant with salt, cumin and coriander. Place several lemon slices on top. Set aside. If you haven't roasted garlic already, take your bulb and cut the top off. Wrap in foil and set aside. On a cookie sheet, toss together your chickpeas, 1 garlic clove, cumin, za'atar, paprika, salt and pepper and olive oil. Toss to mix well. Roast everything at the same time at 400 degrees F for about 40 minutes. 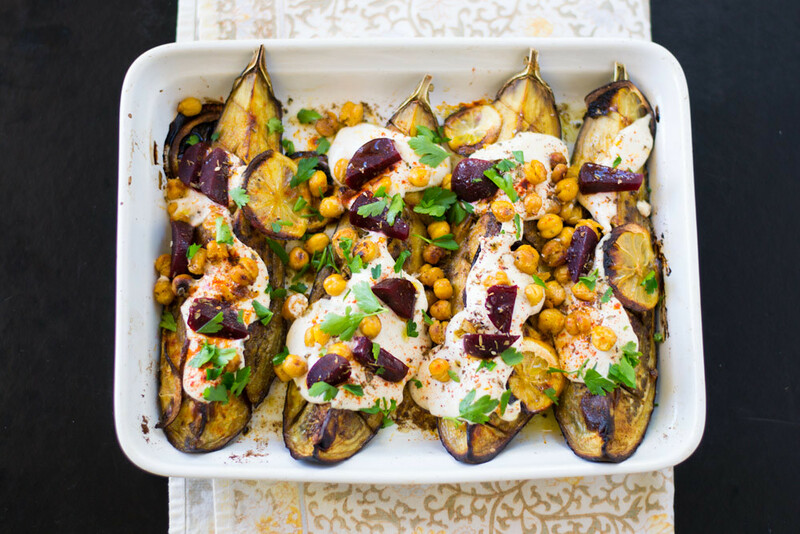 You will know when it is done when the garlic is tender, the eggplant is very soft and the chickpeas are roasted. When done, allow to cool. Now make the tahini sauce. In a food processor, put all tahini sauce ingredients in, including your newly roasted garlic. Pulse together and add water if necessary. It should be thick but still thin enough to spoon over eggplant. Taste for seasoning. 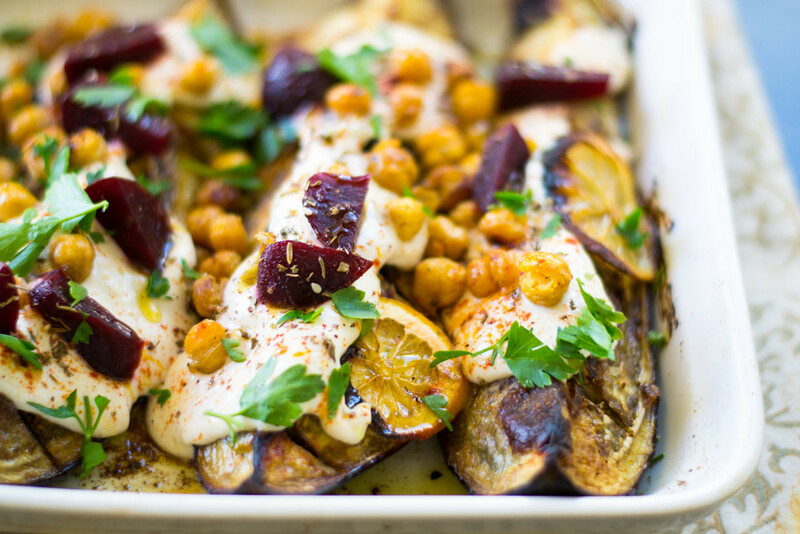 To assemble, spoon tahini sauce over eggplant, top with chickpeas and add additional toppings such as roasted beets and chopped parsley. Drizzle everything with a healthy drizzle of good olive oil and sprinkle with sea salt and za'atar. This is so clever, I absolutely adore eggplant. Just pinned. Thank you sooooo much Cheri! I also feel that Sometimes I could go vegetarian. But, not vegan. Like you, I love cheese wayyy too much! 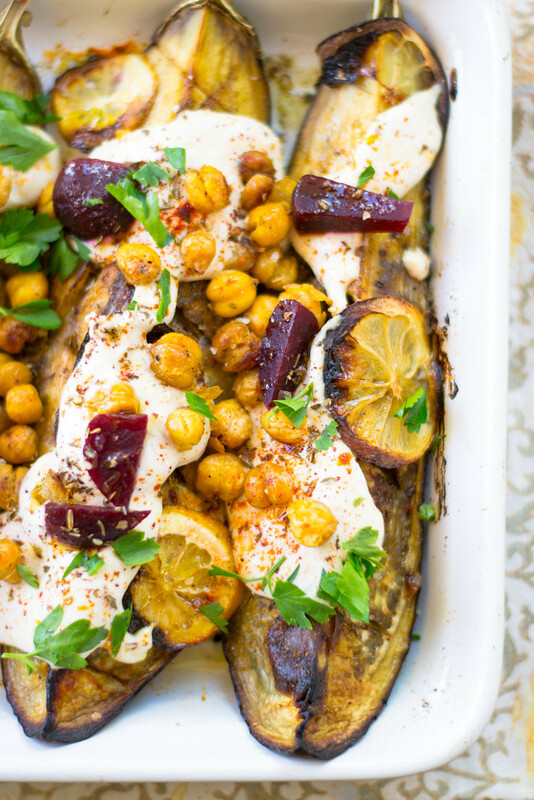 This is such a great idea for a hearty veggie dish! This sounds so delightful with the tahini sauce and roasted beets. I’m pinning this! Hi Kevin! Thank you SOOO much for your awesome compliment! Eggplant may be my new addiction! I’m never one to turn down a big bowl of baba ghanoush, but I think the deconstructed version looks even better! Thank you SO much Kiersten! Such a compliment from you…but now I am kinda obsessed with “stuffing” eggplant now! I’m also such a closet vegetarian. This recipe is legitimately ALL my favorite veggie flavors. Would be perfect this Passover season (you gotta be prepared)! Ahh yes I need to stack up on matzoh asap!! I can’t wait to try to make this. It looks divine! I’d had a jar of tahini sitting in my cupboard unopened for a long time. It’s ready to be used! Wonderful idea and great pictures! I already love it and pin it too. I’m going to make it as soon as possible. Hi Olga! Please let me know when you make it!! Thank you so much!